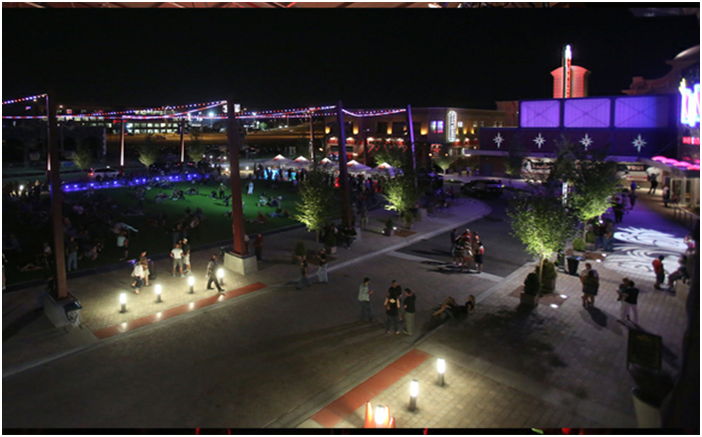 The MB Financial Park at Rosemont needed a one of a kind solution for its multipurpose courtyard located in the center of the entertainment district at the Village of Rosemont. AirField Systems "AirDrain" provided a drainage layer of 92% air which allowed their ice skating rink to be utilized as a seasonal synthetic turf courtyard during the spring, summer and fall. MB Financial Park at Rosemont http://www.rosemont.com/the_park_at_rosemont.php which opened in 2012 is a new development that features lively bars and restaurants with live music, casual dining, bowling, and outdoor patios. A seasonal courtyard in the center of it all perfect for concerts, farmers markets, movies under the stars & ice skating. Located in the heart of the entertainment district, MB Financial Park at Rosemont is only a block from the Donald E. Stephens Convention Center and is anchored by Muvico 18- Movie Theater, a number of hotels and the vibrant Akoo Theatre at Rosemont. When Caitlin Paloian with the Village of Rosemont was asked about how the synthetic lawn performed during the rain storms on August 4th the second day of the "Rockin' in the Park" music festival she said "We had a big rain that cancelled the first act of the festival but as soon as the rain stopped we were able to use the synthetic lawn right away with no standing water or puddles. The AirField Systems AirDrain worked perfectly!" When Brian Reetz with Design Collective http://www.designcollective.com/ began designing this seasonal space he knew they would need an exceptional drainage layer. 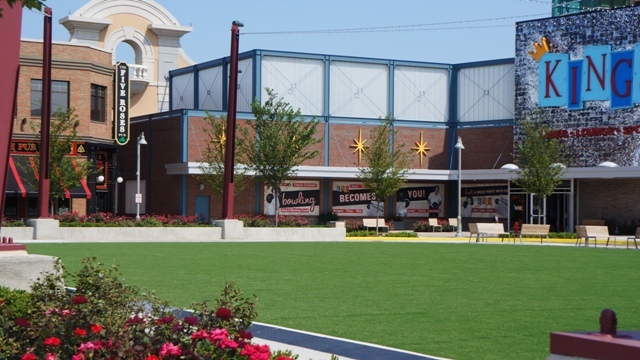 This unique design needed to be flat enough to be utilized during the winter as an ice skating rink (which has to have a virtually flat subsurface for the ice to be usable) and also be used as a synthetic lawn courtyard for the remaining seasons of the year for outdoor events at the growing entertainment district of Rosemont. After testing multiple drainage systems Design Collective, SynLawn of Chicago, Northern Builders and Bradley A. Stephens, Mayor of Rosemont found that AirField Systems "AirDrain" was the only solution that would allow sufficient drainage for the synthetic turf courtyard during the spring, summer and fall. Brian Reetz said, "AirDrain's 100% vertical drainage, its 92% air void and its patented expansion and contraction joints made it easy to install. It's also easy to uninstall for storage in the fall and winter and then reinstall in the spring. And after watching Mayor Stephens drive his SUV over the test plot we knew the AirDrain would withstand any small vehicle traffic that may be necessary on the site. AirDrain surpassed our seemingly unachievable expectations." AirField Systems 100% recycled "AirDrain" geocell grid provides Architects and Engineers the ability to creatively design roof tops, sports fields, synthetic lawns and many other green spaces while maintaining the unmatched ability to deal with drainage, water storage and runoff issues. Please visit us at http://www.airfieldsystems.com/ to learn more about how AirField Systems can help you create a unique, sustainable and high performing drainage design. Ice on The ParkUtilized as an Ice skating rink during the winter months. Evening at The ParkNightime view of The Park The Park at RosemontA venue available for various outdoor events. AirDrain Stacked 798sqft per palletAirDrain Stacked on a pallet for easy shipping and storage. The Park at RosemontA venue available for various outdoor events.